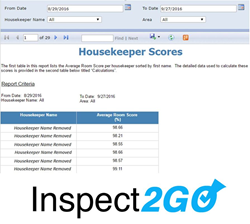 Inspect2GO (http://www.inspect2go.com/hotels/housekeeping-software) offers state-of-the-art inspection management software that combines mobile, cloud and database technology. Inspect offline and manage online with software designed by inspectors, for inspectors. Inspections are conducted on a native mobile app that’s easy to use and functions everywhere, offline, without the need for data connectivity. iPad, Android tablet and Windows (Surface Pro) mobile applications are available. The database software enables scheduling, ad-hoc reporting, financials, permitting and management functions.